Every Concare project is time-sensitive, and by maintaining a Midwest focus, we maximize our service capabilities to customers. 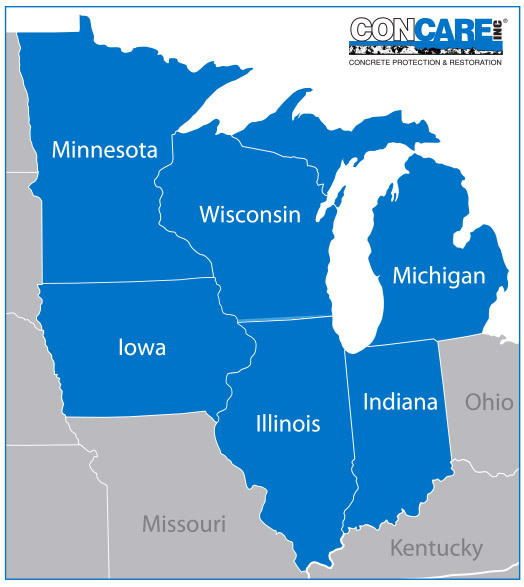 You can count on Concare to provide the best-of-class service in Illinois, Wisconsin, Indiana, Michigan and Iowa. Concare's top priority is meeting our customers' scheduling demands. We maintain a project schedule flexible to accommodate second shifts, weekends, holidays and last-minute projects. Concrete floor protection projects are planned to minime operational downtime. When time is crucial, Concare ensures labor, material and equipment are available to keep the concrete floor protection project on track. Here is a list of just some of the cities Concare services. Call us to tell us what city you're located in.